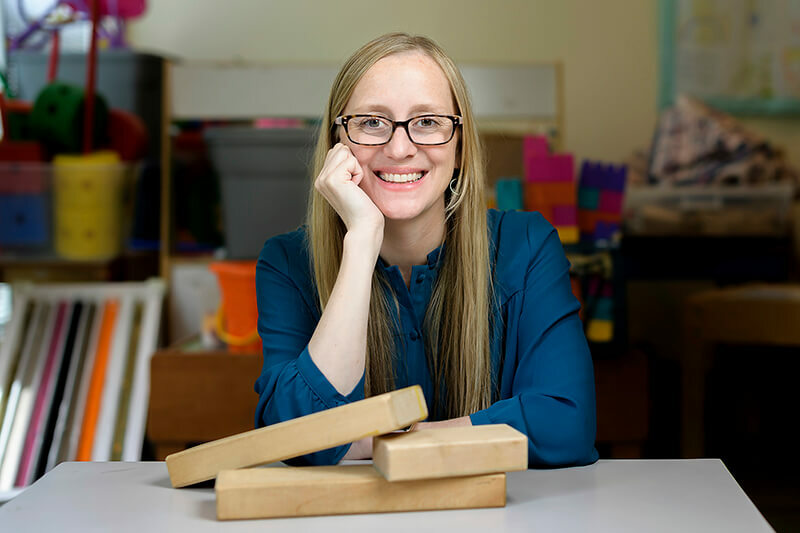 Semi-structured block play among preschool-age children has the potential to improve two skills – mathematics and executive functioning – critical to kindergarten readiness, according a new study by Purdue University researchers. “As an early childhood expert, I feel like I’m constantly being asked by parents and teachers, ‘What can I do with my child to support their school readiness skills?’” said Sara Schmitt, an assistant professor in the Department of Human Development and Family Studies. The study, which has been published online in Early Childhood Research Quarterly, found that a semi-structured block play intervention improved math skills, such as numeracy, shape recognition and mathematical language, and two indicators of executive functioning, including cognitive flexibility and global executive functioning. Executive functioning is the ability to pay attention, remember and use environmental input, and inhibit natural responses in favor of more adaptive ones. Children of parents with low educational attainment benefited the most from intervention participation, according to the findings, suggesting block play could be most impactful on students with lower socioeconomic backgrounds. Children from 3 to 5 years old assigned to the intervention group participated in 14 small group play sessions lasting 15 to 20 minutes. Students were given sets of wooden blocks varying in shapes and sizes and were provided short prompts prior to each session, which became progressively more difficult. “We started very simple and then, by the end, we were asking them to do very complex things,” Schmitt said. “For example, in the first session, we asked the children to build a tower. Two to three 20- to 30-minute assessments, which were administered in aquiet space before and after the series of interventions, revealed a pattern of growth among children who participated in semi-structured block play. Article reposted with permission from Purdue University.